Because I'm bursting with Star Trek love today on the franchise's 50th birthday, and just in case you're looking for some free Star Trek discussion, I thought I'd repost these Trek-related "Looking Back in Genre History" StarShipSofa podcast segments of mine. If you listen, I hope you enjoy! First, my tribute to the weird and wonderful multi-crossover Ishmael by Barbara Hambly, a most unusual Star Trek novel, and one of my very favorite ones: here it is! Second, inspired by my essay "The Sword in the Starship: Arthuriana in Four Incarnations of Star Trek" (published in Winedark Sea), here is my two-part discussion of Arthuriana and Star Trek. Third, inspired by my essay "If This Is the (Final) Frontier, Where Are the Natives?" (published in Star Trek and History), here is my three-part discussion of Native America and Star Trek. Thanks for letting me share these with you. And last, just for nostalgia and laughs, here is the most fangirlish photo I think I have. 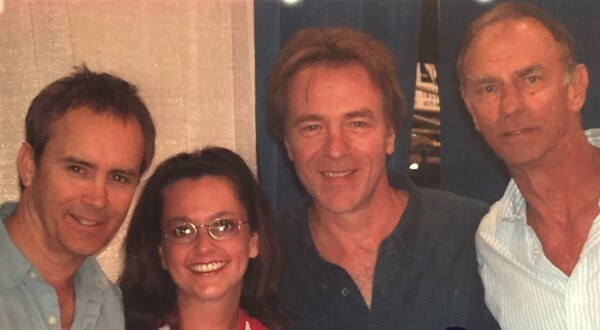 This is me with the wonderful Star Trek: Deep Space Nine "baddie" triumvirate of Jeffrey Combs (Weyoun), Casey Biggs (Damar), and Marc Alaimo (Gul Dukat). That was a very fun day! Don't forget to check out the new 50th Anniversary documentary on the History Channel! Very true! Though I have to admit it was, with the exception of the first third or so, something of a disappointment. Sigh. me, too!!!!! i felt 10 yARs old! When I was a kid, I was in one of the few TV markets that wasn't showing Trek daily. We had to wait for a semiannual overnight marathon starting at 11 pm hosted by Mike McKay. I came home from school and went right to bed so I could try to stay up all night. Dagger of the Mind is really freaky when you're sleep deprived at 3 am! Bookmarking the podcasts--and totally fangirling the photo! What a great set of villains! Thank you so much! :) DS9 had such amazing villains.